The Writer's Challenge: Ready, Set, NaNoWriMo!!!!!!!!!!! 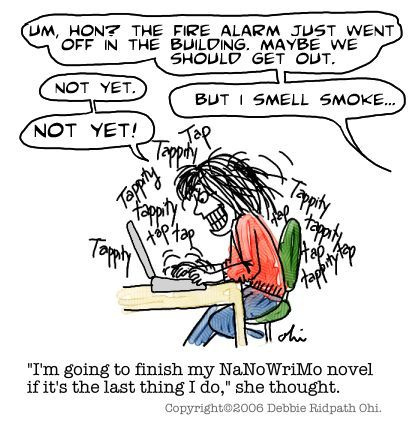 Today is the big day - November 1st, the first official day of NaNoWriMo. I am so excited to finally get to start writing for "Snowed in with a Millionaire", a romance that I am targeting towards the Silhouette Desire line. 1) Sign up for the event by clicking the "Sign Up Now" link at the top of the site. It's right there above "National." 2) Check your email and read the ginormous email our noveling robots send you. It will have "Love" in the subject line, and may be hiding in your Junk folder. 3) Log into your account and use the links on the My NaNoWriMo page to set your timezone, affiliate with a region, and tell us a little bit about yourself. 4) Begin procrastinating by reading through all the great advice and funny stories in the forums. Post some stories and questions of your own. Get excited. Get nervous. Try to rope someone else into doing this with you. Eat lots of chocolate and stockpile noveling rewards. 5) On November 1, begin writing your novel. Your goal is to write a 50,000-word novel by midnight, local time, on November 30th. You write on your own computer, using whatever software you prefer. 6) This is not as scary as it sounds. 7) Starting November 1, you can update your word count in that box at the top of the site, and post excerpts of your work for others to read. Watch your word-count accumulate and story take shape. Feel a little giddy. 8) Write with other NaNoWriMo participants in your area. Write by yourself. Write. Write. Write. 9) If you write 50,000 words of fiction by midnight, local time, November 30th, you can upload your novel for official verification, and be added to our hallowed Winner’s Page and receive a handsome winner’s certificate and web badge. We'll post step-by-step instructions on how to scramble and upload your novel starting in mid-November. 10) Win or lose, you rock for even trying. Start from scratch. None of your own previously written prose can be included in your NaNoWriMo draft (though outlines, character sketches, and research are all fine, as are citations from other people's works). Write a novel. We define a novel as a lengthy work of fiction. If you consider the book you're writing a novel, we consider it a novel too! If you have any questions, just check out our FAQs. And best of luck in November! Today I begin. I wanted to stay up past midnight and start writing at the official beginning of Nov 1st, but I was asleep by 11:45pm. Life of a mommy I guess. I'm going to an official write-in with some other WriMos this afternoon, which should be fun. I'm bringing earplugs though just in case I find it too distracting, since I'm used to writing alone.